The Orangeburg massacre refers to the shooting and killing of peaceful unarmed black student protesters by white Highway Patrol officers in Orangeburg, SC, on the South Carolina State University campus on the evening of February 8, 1968. Approximately 200 protesters peacefully demonstrated against racial segregation at a local bowling alley, All Star Bowling lane, without incident on February 6, 1968. The following night many of the students returned to resume the protest but fifteen of them were arrested. The third night, February 8th, the students gathered on the South Carolina State University campus instead of at the bowling alley. The students built a bonfire which a law enforcement officer attempted to put out. The officer was injured by a piece of a banister thrown from the crowd. The officers then opened fire into the crowd of students. 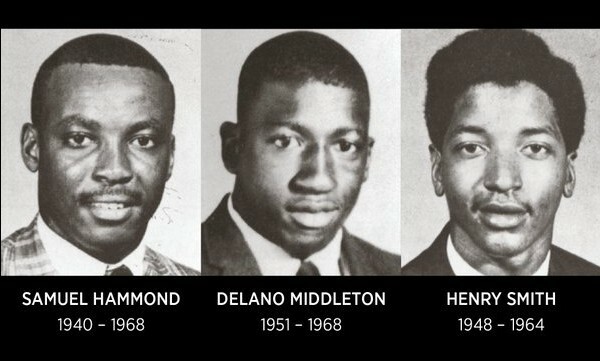 Three of those peacefully assembled, Samuel Hammond, Henry Smith, both SC State students and Delano Middleton, a 17-year-old high school student, were killed and twenty-seven other protesters were injured. Middleton was not involved in the protests. His mother worked as a maid on campus, and he often stopped there on his way home from basketball practice. In all, he was shot seven times, once in the heart. Henry "Smitty" Smith, an ROTC student and native of Marion, was shot three times, including in his neck. "Sam" or "Sammy" Hammond was a freshman from Barnwell who was studying to be a teacher. He was shot in the back and died on the floor of Orangeburg's segregated hospital. Also killed was the unborn child of Louise Kelly Cawley, age 27, one of the young women beaten during the protest at All Star Bowling. Cawley suffered a miscarriage the following week. “They committed murder. Murder…that’s a harsh thing to say, but they did it,” …“The police lost their self control. They just started shooting. It was a slaughter. Double ought buckshot is what you use for deer. It’s meant to kill. One guy emptied his service revolver. That takes a lot of shooting. The (students) are running away. Pow, pow, pow, pow, pow, pow! My God, there’s a murderous intent there. We are lucky more weren’t killed.” – Ramsey Clark, U.S. Attorney General in 1968. This tradedy was the first of its king on any American college campus. The massacre pre-dated the 1970 Kent State shootings and Jackson State killings, in which the National Guard at Kent State, and police and state highway patrol at Jackson State, killed student protesters demonstrating against the United States invasion of Cambodia during the Vietnam War. There were several incidents centering on the segregation of the local bowling alley, All Star Bowling Lane, that led up to the Orangeburg Massacre on February 8, 1968. In the fall of 1967, some of the black leaders within the community tried to convince Harry K. Floyd, the owner of the bowling alley, to allow African Americans. Harry K. Floyd claimed that the Civil Rights Act of 1964 did not apply to his establishment because it was private. However, because the alley operated a lunch counter, it fell under the jurisdiction of laws regulating interstate commerce and thus federal desegregation. Floyd was unwilling to desegregate; as a result protests began in early February 1968. Over the next couple of days, the tension in Orangeburg escalated. Student protesters submitted a list of demands that consisted of integration and the elimination of discrimination within the community. The Governor of South Carolina at the time, Robert E. McNair, responded by calling in the National Guard after commenting that black power advocates were running amok in the community. Over the next two days, about 200 mostly student protesters gathered on the campus of South Carolina State University, a historically black college in Orangeburg, to demonstrate against the continued segregation at the bowling alley. By the late evening of February 8th, army tanks and over 100 heavily armed law enforcement officers had cordoned off the campus; 450 more had been stationed downtown. On the night of February 8, 1968, students started a bonfire on the front of SC State's campus. As police and firefighters attempted to put out the fire, officer David Shealy was injured by a thrown object. Shortly thereafter (around 10:30 p.m.) South Carolina Highway Patrol Officers began firing into the crowd of around 200 protesters. Eight Patrol Officers fired carbines, shotguns, and revolvers at the protesters, which lasted around 10 to 15 seconds. Twenty-seven people were injured in the shooting; most of whom were shot in the back as they were running away, and three African American men were killed. The three men killed were Samuel Hammond, Henry Smith (both SCSU students), and Delano Middleton, a student at the local Wilkinson High School. Middleton was shot while simply sitting on the steps of the freshman dormitory awaiting the end of his mother's work shift. The police later said that they believed they were under attack by small arms fire. A newspaper reported, "About 200 Negros gathered and began sniping with what sounded like 'at least one automatic, a shotgun and other small caliber weapons' and throwing bricks and bottles at the patrolmen." Similarly, a North Carolina newspaper reported that week that students threw firebombs at buildings and that the sound of apparent sniper fire was heard. Protesters insisted that they did not fire at police officers, but threw objects and insulted the men. An AP photographer on the scene, subsequently revealed that he heard no gunfire from the campus. At a press conference the following day, Governor Robert E. McNair said the event was "…one of the saddest days in the history of South Carolina". McNair blamed the deaths on outside Black Power agitators and said the incident took place off campus, contrary to the evidence. The federal government brought charges against the state patrolmen in the first federal trial of police officers for using excessive force at a campus protest. The state patrol officers' defense was that they felt they were in danger and protesters had shot at the officers first. All nine defendants were acquitted although thirty-six witnesses stated that they did not hear gunfire coming from the protesters on the campus before the shooting and no students were found to be carrying guns. In a state trial in 1970, the activist Cleveland Sellers, who had been shot during the attack, was convicted of a charge of riot related to the events on February 6 at the bowling alley. He served seven months in state prison, getting time off for good behavior. He was the national program director of the Student Nonviolent Coordinating Committee (SNCC). In 1973 he wrote The River of No Return: The Autobiography of a Black Militant and the Life and Death of SNCC. Sellers earned his master's degree from Harvard and his doctorate from the University of North Carolina at Greensboro. For eight years, he served as the president of Voorhees College, located in his hometown of Denmark, before stepping down in 2016 due to failing health. Cleveland Sellers stands beside the historic marker on the S.C. State University campus at the 2000 Orangeburg memorial. In 1993, twenty-five years after the massacre, Sellers was officially pardoned by the governor of South Carolina after evidence proved he was innocent. Previous PostPercy Julian – Chemical and Drug PioneerNext PostWere 1200 black soldiers massacred by white soldiers in Mississippi?